A fine old-school picture...elevated further by its progressive themes. 183 min. 20th Century Fox. Directors: Robert Wise, Charles H. Maguire. Cast: Steve McQueen, Richard Attenborough, Richard Crenna, Candice Bergen, Larry Gates. When most people think of Steve McQueen, they leap to the motorcycle jump in The Great Escape or perhaps the speeding cars of Bullitt and Le Mans. But McQueen did his best work—and won his only Oscar nomination—bonding with the engine of a gunboat in Robert Wise's The Sand Pebbles. Newly transferred to the San Pablo, the emotionally clammed-up Jake Holman is looking forward to a simple life of non-interference: just him and his engine. But the unexpected culture of the boat, docked off of China in 1926, complicates Holman's plans. An integrated crew of Navy men and Chinese coolies forces Jake to challenge his assumptions of what the "slopeheads" and, indeed, himself should be doing. Many who knew McQueen think Jake Holman was closest in character to the actor himself, who always carried with him the emotional wounds of a troubled childhood. McQueen's riveting, emotionally detailed performance showcases the actor's legendary ability to say more with his eyes and body language than with words. Playwright Robert Anderson (I Never Sang for My Father) adapted Richard McKenna's novel, but clashes with the decidely less verbal McQueen meant Anderson got sent packing, with director Wise presumably taking on rewriting chores himself. For Wise's part, the film was an opportunity to strike an artistic blow against imperialism. The story of America's misguided and unwanted presence in a foreign land it didn't understand was boldly timed to coincide with American interventionism in Vietnam. 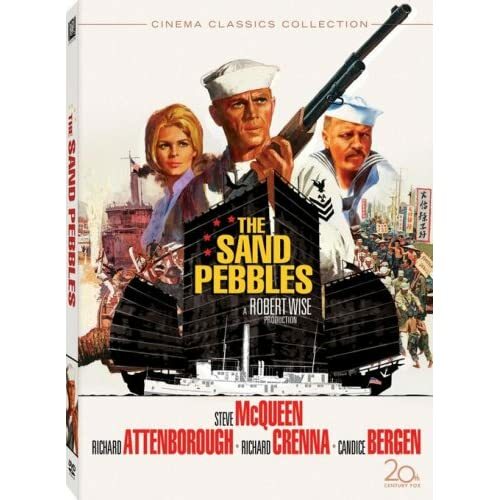 The Sand Pebbles is a fine old-school picture (love that production design by Boris Leven), elevated further by its progressive themes. While the San Pablo bobs on the Yangtze, Chiang Kai-Shek and his followers face off with feudal warlords—ironically, the fervent factions, Nationalist and Communist alike, can agree on one thing: they want the Americans to go home. The tension is deeply felt within the walls of the Shanghai brothel frequented by the crew (who call themselves "sand pebbles"). There, brutish crew member "Ski" Stawski (the inimitable Simon Oakland) sets his eyes on the hostess, Maily (Marayat Andriane), a virgin whose price is set at $200. Stawski's clearly unwelcome lasciviousness raises the ire of Frenchy (Richard Attenborough), Holman's only friend on the San Pablo. The two conspire to raise the money to free her, a goal that coincides with a boxing match designed by Holman as a badly needed opportunity for his engine-room assistant Po-han (Mako). Despite the ongoing, romantic efforts of Candice Bergen's missionary to bring Jake out of his shell, the story grows steadily darker, culminating in destruction. After once insisting, "I just run the engine. All this other...I don't fool with it," Holman finds himself taking up arms at the insistence of ship's Captain Collins (Richard Crenna), who wants to save face for his disgraced vessel by rescuing the missionaries from the revolutionaries. Strident missionary leader Jameson's disinterest in being saved is only the beginning of the climactic downward spiral, reflected in Jameson's plaintive cry "Damn all flags! It's too late in the world for flags!" and resolved poetically (and mortally) by the aching, desolate question "What the hell happened?" 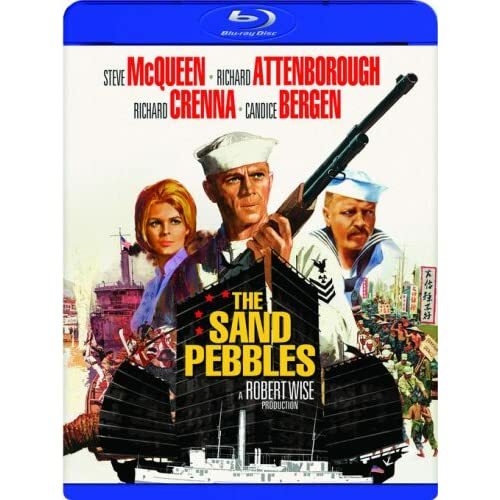 The Blu-Ray special edition of The Sand Pebbles is the very best way to enjoy this classic film on home video. Presented with its overture and intermission music intact, this Roadshow film gets an outstanding, well-scrubbed transfer that shows off the image at its detailed best, free of dirt and with accurately rendered color. For those with surround sound, the DTS-HD 5.1 Master Lossless Audio track completes the illusion that your home theatre is a movie palace. 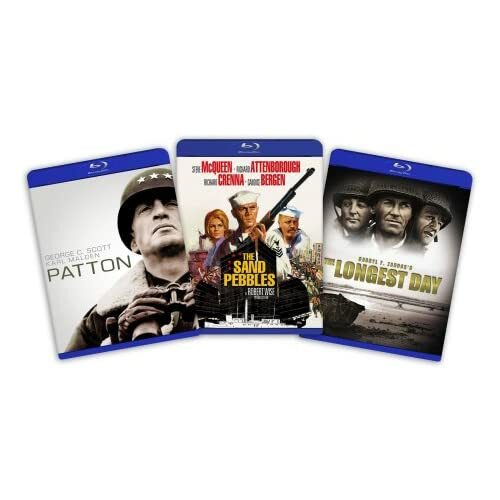 Fox's 50GB dual-layer disc houses a treasure trove of bonus features, starting with an audio commentary that effortlessly assembles the reminiscences of Robert Wise, Mako, Richard Crenna, and Candice Bergen: it's a steady stream of interesting perspectives and memories. Film buffs will be especially pleased to listen to the Isolated Score Track highlighting Jerry Goldsmith's music, with the interspersed comments of music producer Nick Redman, film music historian, and film historian/screenwriter Lem Dobbs. One can also watch the film (and/or listen to a commentary) with the subtitle Trivia Track enabled, one that focuses on the history and culture of 1926 China. Also on hand are thirteen additional Road Show Scenes (in standard definition, and aggravatingly lacking a "Play All" option): "Sew Sew" (:47), "Under the Floor Plates" (:45), "Local Bandits" (1:01), "Stopped for Repairs" (1:08), "Arrival in Changsha" (:12), "After the Bet" (:53), "Looking for Jameson" (:52), "Requesting Transfer" (:19), "Escorted Back" (:45), "'Two Loose Twigs'" (1:18), "Dinner With Shirley" (2:27), "'Stay Clear of Them'" (:47), and "Fire on the Deck" (2:49). Oddly, the principal documentary—"The Making of The Sand Pebbles" (1:03:41)—is misfiled under the Road Show Scenes menu. Along with glimpses of the film's storyboards, the doc gathers comments by Wise, Bergen, Richard Attenborough, studio head Richard Zanuck, film critic F.X. Feeney, McQueen's business partner Robert Relyea, McQueen's then-wife Neile Adams, associate producer Charles Maguire, stunt coordinator Loren Janes, and film composer Charles Bernstein. The Side Bars menu holds "Steve McQueen Remembered" (10:45) with Norman Jewison, Relyea, Adams, Zanuck, Attenborough, and Janes; "Robert Wise in Command" (10:38), with Wise, Relyea, Zanuck, Jewison, Attenborough, Bergen, Feeney, Janes, Julie Andrews, Marsha Mason, Robert Mitchum, Ernest Lehman, and Rita Moreno; and "China 1926" (12:54), a fine historical overview with authors/professors J.A.G. Roberts and Merle Goldman ,who somewhat direct their comments to the film's depictions. The 1966 menu hosts three vintage promotional pieces. "A Ship Called San Pablo" (14:28) and "The Secret of San Pablo" (8:52) are similar color promotional short subjects, the former narrated by Richard Attenborough and the latter narrated by Richard Crenna; both feature a wealth of behind-the-scenes footage sampled by the disc's featurettes. Also here is the Theatrical Trailer (3:18). Lastly, Fox includes two Radio Documentaries narrated by Attenborough—"Changsha Bund and the Streets of Taipei" and the suspiciously familiar "A Ship Called San Pablo"—and three Radio Spots for the film. That's right, folks: this is a special edition that leaves no pebble unturned. All site content © 2000-2019 Peter Canavese. Page generated at 04/24/2019 07:50:36AM.